A British music publicist reportedly made clear the nature of a meeting between Trump Jr. and Russian lawyer Natalia Veselnitskaya. Donald Trump Jr. was told that he would receive "compromising" information on Hillary Clinton as "part of a Russian government effort" to help the Trump campaign, the New York Times reports. 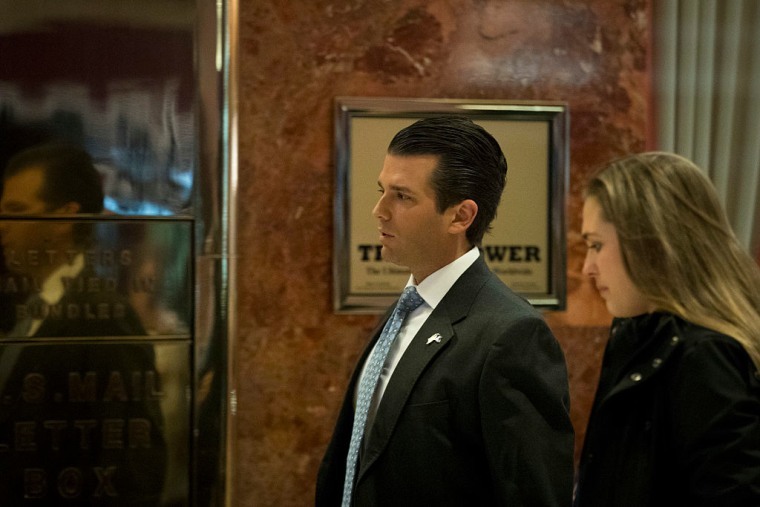 On Sunday Trump Jr. confirmed attending a meeting with Russian lawyer Natalia Veselnitskaya in June 2016 on the promise of her having damaging information about the then Democratic candidate. In a new report published on Monday, the Times added that the intermediary who set up the meeting made it clear that the information was part of a Russian effort to help his father's campaign. The Times did not publish the email, which was sent by British music publicist Rob Goldstone, but carried three sources describing the nature of the message. It is not yet known if Goldstone knew where the potential information was coming from, and one person cited in the report said it appeared Goldstone was sending Trump Jr. information he had received through various people. Alan Futerfas, Trump Jr’s new lawyer for the Russian investigations, described the report as “much ado about nothing” in a statement released on Monday.